The House System at CCS is a fun family that serves and celebrates together: all together, unity in diversity, loving as we have been loved. The House System, originally also called a “residential college system,” is a concept borrowed from our European and United Kingdom roots. It was designed for residential boarding schools at colleges and was brought to the United States at schools like Yale and Harvard. The purpose was to inculcate a “home” atmosphere for the students. At many secondary schools in the United States, House Systems are employed to provide more opportunity for student body unity. “So that in all things, as aforesaid; the Unity in Trinity, and the Trinity in Unity, is to be worshipped. He therefore that will be saved, let him thus think of the Trinity” (emphasis added). We believe that relationship is imprinted on God’s creation, with the purest concentration being given to mankind, those bearing the Imago Dei, the image of God. One way of both confessing and worshipping God, the Three-in-One, is to be like Him in the way a child is like a father. He made us diverse. He made us to be in unity—with Him and with each other. Unity and diversity—as He is, so are we. This is the main goal of the House System. In the House System, we embody the love that God has given in how we live and what we do. That began by developing houses that encompass grades from 6-12. 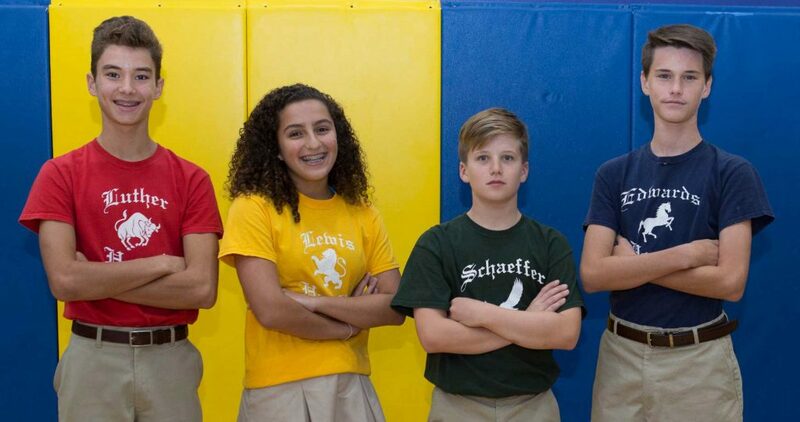 The purpose is to provide an opportunity for what we call “vertical unity.” Rather than the standard categories of grade and age providing an identity, the House encourages underclassmen to look up to and interact with older students, while the upper classmen are given the opportunity to lead and care for the younger students. The Edwards House, named after eighteenth-century American theologian and Pastor Jonathan Edwards, is the House of Service and Feeding. It provides the structure and execution of the secondary school lunch system, as well as various fellowships, meals, and meetings. The Lewis House, named after C.S. Lewis, twentieth-century scholar, author, and theologian at Magdalen College, Oxford University, is the House of Community Formation. It supports and plans many outreach and ingathering events, including the annual Family Festival, Homecoming, Secret Santa, and Grandparents’ Days. The Luther House, named after sixteenth-century German Reformer, pastor and theologian Martin Luther, is the House of Spiritual Formation and Reformation. It aids and encourages through prayer, provision of the Word of God in posting reminders and giving Bibles, and spiritual devotion to God and the joy of all peoples in every aspect of life. The Schaeffer House, named after Francis Schaeffer, twentieth-century author and apologist, is the House of Celebration. It provides the support and planning of the various school celebrations such as Snowball and Protocol. The students are involved in all of these service opportunities and events in concert with administrative and volunteer adults, but are encouraged to take as much responsibility in the events as possible. That they do with excellence.